This article is about ancient Roman holidays. For the symphonic poem by Ottorino Respighi, see Roman Festivals (Respighi). Imperativae were holidays held "on demand" (from the verb impero, imperare, "to order, command") when special celebrations or expiations were called for. One of the most important sources for Roman holidays is Ovid's Fasti, an incomplete poem that describes and provides origins for festivals from January to June at the time of Augustus. Varro defined feriae as "days instituted for the sake of the gods." Religious rites were performed on the feriae, and public business was suspended. Even slaves were supposed to be given some form of rest. Cicero says specifically that people who were free should not engage in lawsuits and quarrels, and slaves should get a break from their labors. Agricultural writers recognized that some jobs on a farm might still need to be performed, and specified what these were. Some agricultural tasks not otherwise permitted could be carried out if an expiation were made in advance (piaculum), usually the sacrifice of a puppy. Within the city of Rome, the flamens and the priest known as the Rex sacrorum were not allowed even to see work done. On a practical level, those who "inadvertently" worked could pay a fine or offer up a piaculum, usually a pig. Work considered vital either to the gods or preserving human life was excusable, according to some experts on religious law. Although Romans were required not to work, they were not required to take any religious action unless they were priests or had family rites (sacra gentilicia) to maintain. Following is a month-by-month list of Roman festivals and games that had a fixed place on the calendar. For some, the date on which they were first established is recorded. A deity's festival often marked the anniversary (dies natalis, "birthday") of the founding of a temple, or a rededication after a major renovation. Festivals not named for deities are thought to be among the oldest on the calendar. Some religious observances were monthly. The first day of the month was the Kalends (or Calends, from which the English word "calendar" derives). Each Kalends was sacred to Juno, and the Regina sacrorum ("Queen of the Rites," a public priestess) marked the day by presiding over a sacrifice to the goddess. Originally a pontiff and the Rex sacrorum reported the sighting of the new moon, and the pontiff announced whether the Nones occurred on the 5th or 7th of that month. On the Nones, announcements were made regarding events to take place that month; with the exception of the Poplifugia, no major festivals were held before the Nones, though other ceremonies, such as anniversaries of temple dedications, might be carried out. The Ides (usually the 13th, or in a few months the 15th) were sacred to Jupiter. On each Ides, a white lamb was led along the Via Sacra to the Capitolium for sacrifice to Jupiter. The list also includes other notable public religious events such as sacrifices and processions that were observed annually but are neither feriae nor dies natales. Unless otherwise noted, the calendar is that of H.H. Scullard, Festivals and Ceremonies of the Roman Republic. 1 (Kalends): From 153 BC onward, consuls entered office on this date, accompanied by vota publica (public vows for the wellbeing of the republic and later of the emperor) and the taking of auspices. Festivals were also held for the imported cult of Aesculapius and for the obscure god Vediovis. In the archaic Roman calendar, February was the last month of the year. The name derives from februa, "the means of purification, expiatory offerings." It marked a turn of season, with February 5 the official first day of spring bringing the renewal of agricultural activities after winter. In the old Roman calendar (until perhaps as late as 153 BC), the mensis Martius ("Mars' Month") was the first month of the year. It is one of the few months to be named for a god, Mars, whose festivals dominate the month. 23: Tubilustrium, purification of the trumpets. A major feriae conceptivae in April was the Latin Festival. The feriae conceptivae of this month was the Ambarvalia. Scullard places the Taurian Games on June 25–26, but other scholars doubt these ludi had a fixed date or recurred on a regular basis. 7: Ludi Piscatorii, "Fishermen's Games"
24: festival of Fors Fortuna, which "seems to have been a rowdy affair"
Until renamed for Julius Caesar, this month was called Quinctilis or Quintilis, originally the fifth month (quint-) when the year began in March. From this point in the calendar forward, the months had numerical designations. 6–13: Ludi Apollinares, games in honour of Apollo, first held in 212 BC as a one-day event (July 13) and established as annual in 208 BC. Until renamed for Augustus Caesar, this month was called Sextilis, originally the sixth month (sext-) when the year began in March. The following "moveable feasts" are listed roughly in chronological order. Compitalia, held sometime between December 17 (the Saturnalia) and January 5; in the later Empire, they were regularly held January 3–5, but Macrobius (5th century AD) still categorized them as conceptivae. Sementivae, a festival of sowing honoring Tellus and Ceres, placed on January 24–26 by Ovid, who regards these feriae as the same as Paganalia; Varro may indicate that the two were separate festivals. 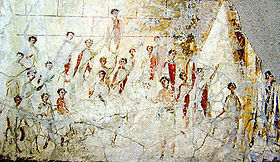 Fornacalia, a mid-February baking festival celebrated by the curiae, the 30 archaic divisions of the Roman people; the date was announced by the curio maximus and set for each curia individually, with a general Fornacalia on February 17 for those who had missed their own or who were uncertain to which curia they belonged. Amburbium, a ceremony to purify the city (urbs) as a whole, perhaps held sometime in February. Feriae Latinae (Latin Festival), a major and very old conceptivae in April. Ambarvalia, purification of the fields in May. The Rosalia or "Festival of Roses" also had no fixed date, but was technically not one of the feriae conceptivae with a date announced by public priests based on archaic practice. Festivals were also held in ancient Rome in response to particular events, or for a particular purpose such as to propitiate or show gratitude toward the gods. For example, Livy reports that following the Roman destruction of Alba Longa in the 7th century BC, and the removal of the Alban populace to Rome, it was reported to have rained stones on the Mons Albanus. A Roman deputation was sent to investigate the report, and a further shower of stones was witnessed. The Romans took this to be a sign of the displeasure of the Alban gods, the worship of whom had been abandoned with the evacuation of Alba Longa. Livy goes on to say that the Romans instituted a public festival of nine days, at the instigation either of a 'heavenly voice' heard on the Mons Albanus, or of the haruspices. Livy also says that it became the longstanding practice in Rome that whenever a shower of stones was reported, a festival of nine days would be ordered in response. Another irregular festival of note is the Secular Games. Over the course of several days there were sacrifices, entertainers, and games hosted by the state, attempting to be the greatest display anyone living had ever seen. These games were intended to be held every 100 years with the purpose of it occurring only once in any individuals lifetime. At one point two cycles of the Secular Games were being held simultaneously, leading there to be people who would in fact witness it twice in their life. "Mercatus" redirects here. For the think tank, see Mercatus Center. The noun mercatus (plural mercatūs) means "commerce" or "the market" generally, but it also refers to fairs or markets held immediately after certain ludi. Cicero said that Numa Pompilius, the semi-legendary second king of Rome, established mercatus in conjunction with religious festivals to facilitate trade, since people had already gathered in great numbers. In early times, these mercatus may have played a role in wholesale trade, but as commerce in Rome became more sophisticated, by the late Republic they seem to have become retail fairs specialized for the holiday market. The Sigillaria attached to the Saturnalia may have been a mercatus in this sense. 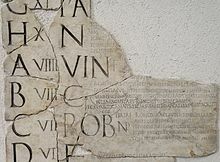 Surviving fasti record Mercatus Apollinares, July 14–19; Mercatus Romani, September 20–23; and Mercatus Plebeii, November 18–20. Others may have existed. The English word "fair" derives from Latin feria. Butchered to make a Roman holiday." More benignly, the phrase was used as the title of a romantic movie set in Rome, Roman Holiday. ^ H.H. Scullard, Festivals and Ceremonies of the Roman Republic (Cornell University Press, 1981), pp. 38–39. ^ Scullard, Festivals and Ceremonies of the Roman Republic, p. 39. ^ Varro, De lingua latina 6.12 (dies deorum causa instituti, as cited by Scullard, p. 39, noting also the phrase dis dedicati, "dedicated to the gods," in Macrobius, Saturnalia 1.16.2. ^ Cicero, De legibus 2.29, as cited by Scullard, p. 39. ^ Cato the Elder, De agricultura 138; Columella 2.21.2; Scullard, Festivals and Ceremonies of the Roman Republic, p. 39. ^ Scullard, Festivals and Ceremonies of the Roman Republic, pp. 39–40. ^ Hendrik Wagenvoort, "Initia Cereris," in Studies in Roman Literature, Culture and Religion (Brill, 1956), pp. 163–164. ^ Scullard, Festivals and Ceremonies of the Roman Republic, pp. 52–58. ^ Recorded only in the Fasti Antiates. ^ Scullard, Festivals and Ceremonies of the Roman Republic, pp. 70–71. ^ Alternatively dated to May 15. ^ Scullard, Festivals and Ceremonies of the Roman Republic, p. 156. ^ John H. Humphrey, Roman Circuses: Arenas for Chariot Racing (University of California Press, 1986), p. 543; Robert Turcan, The Gods of Ancient Rome (Edinburgh University Press, 2000), p. 82. ^ Scullard, Festivals and Ceremonies of the Roman Republic, p. 155. ^ Recorded only by Polemius Silvius. ^ Sumi, Geoffrey S. (August 1, 1997). "Review of: The Comet of 44 B.C. and Caesar's Funeral Games". Bryn Mawr Classical Review – via Bryn Mawr Classical Review. ^ Scullard, Festivals and Ceremonies of the Roman Republic, p. 183. ^ Matthew Bunson, A Dictionary of the Roman Empire (Oxford University Press, 1995), pp. 246–247; Roland Auguet, Cruelty and Civilization: The Roman Games (Routledge, 1972, 1994) pp. 212–213. ^ John Scheid, "To Honour the Princeps and Venerate the Gods: Public Cult, Neighbourhood Cults, and Imperial Cult in Augustan Rome," translated by Jonathan Edmondson, in Augustus (Edinburgh University Press, 2009), pp. 288–290. ^ Scullard, Festivals and Ceremonies of the Roman Republic, p. 58. ^ Scullard, Festivals and Ceremonies of the Roman Republic, p. 68. ^ Fasti Antiates Ministrorum, Fasti Fratrum Arvalium, and the "so-called" Fasti Maffeani = Inscriptiones Italiae XIII.2.377. ^ Claire Holleran, Shopping in Ancient Rome: The Retail Trade in the Late Republic and the Principate (Oxford University Press, 2012), pp. 189–190, 193. ^ "Cruelty". The Oxford Dictionary of Phrase, Saying, and Quotation, 2nd edition. Susan Ratcliffe, ed. New York: Oxford University Press, 2002,109-110.